Butler received the Career and Preparedness Award for its Early College Academy, and is one of top four programs recognized nationwide. 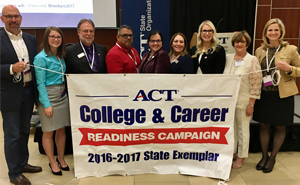 Butler Community College’s Early College Academies were honored by the ACT’s College and Career Readiness Campaign for creating an outstanding foundation to help its students achieve academic success. Butler was the only Kansas College chosen for this honor. The Early College Academies also were named as one of four national semifinalists in the country. The other three semifinalists are programs at the University of Arizona, the University of Alaska and Western Nevada College. Butler sent representatives to the ACT State Organization Symposium that was held at Wichita State University on April 11 and was presented with the Career and Preparedness Award. The ACT College and Career Readiness Campaign is a program that acknowledges the exemplary efforts by high schools, postsecondary institutions and individual students. The criteria that goes into consideration when selecting college recipients is student success and the opportunities the institution creates for students to develop problem-solving, responsibility, goal-setting and career-planning skills. Student success includes retention, graduation and four-year college transfer rates. Butler Community College Early College Academies is a collection of career-specific cohorts where high school students can earn their Associate’s degrees in specific career and technical fields. These students earn dual credit and participate in job shadowing and internships to prepare them for higher education and the workforce.